Mix a light application of a balanced organic fertilizer into the soil prior to planting. 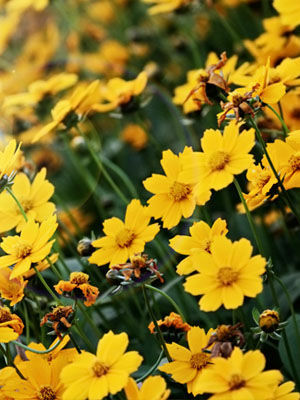 Annual coreopsis needs less fertilizer and water compared to other flowers. The bicolored blooms of coreopsis attract butterflies and beneficial insects. Be patient with this wildflower, which blooms in late summer and fall. Plants will reseed themselves with a little encouragement.